I don't know anything about this book! How is this possible? I like the cover, though, so I would probably pick it up. Thanks for introducing me, Lisa! I'm definitely curious. I think you'd like this one, Ash! I don't like the fact that it reads like semi-middle grade, but I'm still going to give it a shot. :) Great review! Yay! We are twins today. 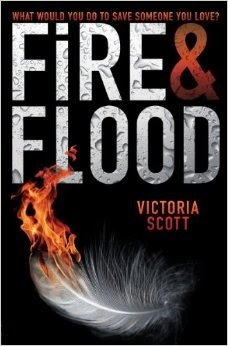 I reviewed Fire and Flood too! I agree with you about it being a bit like The Hunger Games but really being it's own thing too. I also liked Tella. Her inner thoughts were pretty amusing most of the time. YAY! I loved Tella so much. She made this read a win for me too! Right? All of those elements are awesome and the author nails it. Yes the egg companions are so cool! I've been hearing about Fire and Flood a lot recently! It's a mixed bag of opinions, so I'm still not entirely sure I'll be reading it. It's pretty cool to hear about the Pandoras though, since I'm a sucker for a good animal companion in any book! I hear you. I could see why some wouldn't like it, and that's okay! This sounds like The Hunger Games meets, I dunno, some sort of unique fantasy novel, Either way, I am totally intrigued. Besides, snarky MC's are, like, my FAVOURITE thing in the world. So yeah. Count me in! It's funny because I was wondering about this book and being solidly YA. Also, is it safe to assume there isn't much romance? Great review!! Oh, there's a good dollop of romance my friend. Thank you!